This super simple breakfast recipe can be prepared in a flash on busy mornings. 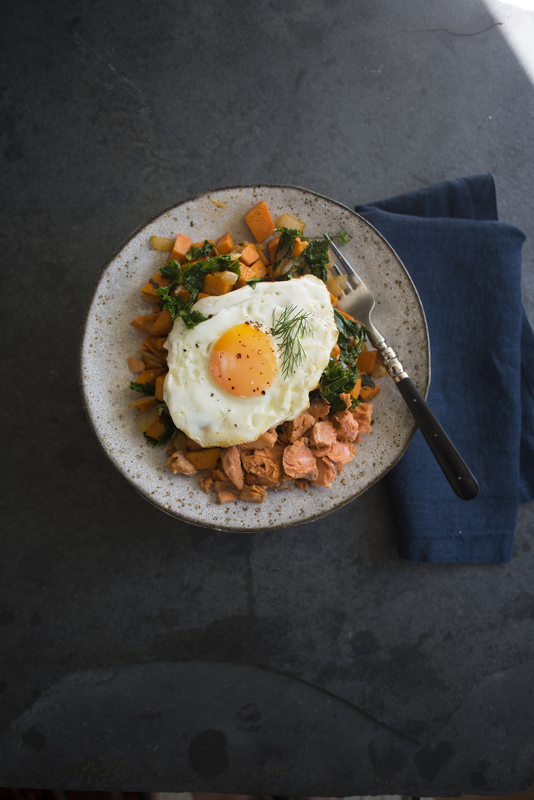 The hash can be made ahead of time if necessary adding the salmon and eggs the morning of. The body likes protein in the mornings, and there is nothing like wild Alaska salmon for that. Delicious! Preheat oven to 200 degrees. In a large skillet soften onions in Avocado Oil, add Sweet Potatoes. Cook for 3-4 Minutes, until sweet potatoes are cooked through and slightly crispy on the outside. Add Kale, it is OK if the pan seems over flowing and deglaze the pan while steaming the vegetables with Veg stock and cook for another 5. Season with Paprika, cayenne, salt and pepper or any other spice blend you like and add Salmon.